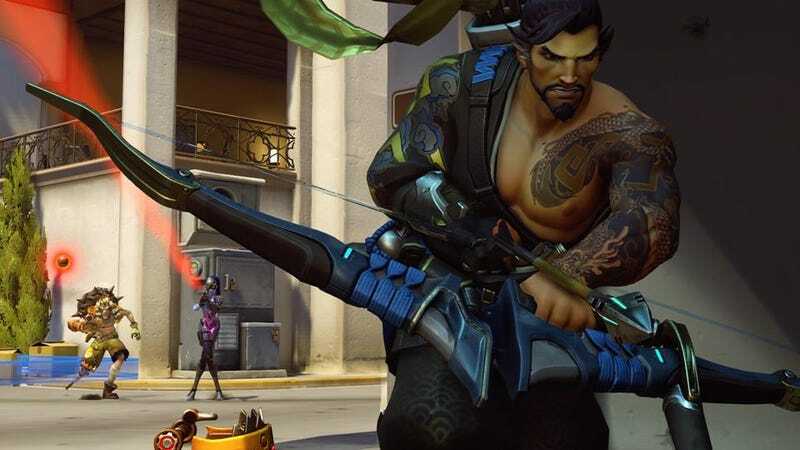 Yesterday, Hanzo mains the world over discovered a pleasant surprise while using their one ability that actually does damage: scatter arrow now has a shorter cooldown, meaning it can be used more often. Blizzard admits this buff was accidental, but for the time being, may not revert it. Scatter arrow fires an arrow that fragments and ricochets off walls. Its cooldown time is now eight seconds, down from a previous time of ten seconds. That may not seem like a huge thing, but in the chaos of an Overwatch team fight—especially one in close quarters, where Hanzo’s scatter arrow shines—every second counts. In a post on Overwatch’s forums, lead designer Geoff Goodman explained how this prickly gaffe came to be. Now, here’s the really strange part about all of this: scatter arrow is the main Hanzo ability the developers have said they plan to dispose of in the dark flames of Jeff Kaplan’s design furnace. While the ability isn’t as easy to use as some players like to claim, it can, in the right hands, be used to one-shot tank characters like Orisa. It’s busted, and even Blizzard has admitted as much. Now it’s been buffed as part of a big update that’s apparently just around the corner. Enjoy it while you can, Hanzo mains. Change, like a scatter arrow from around the aforementioned corner, is coming.